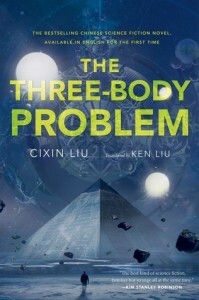 This is the first Chinese Science Fiction book I’ve read and I found that the Chinese setting does bring in some interesting elements and themes so in some ways this is different to anything else I’ve read. In other ways it also seems very familiar because it feels like it owes a big debt to so-called Golden Age Science Fiction having many of the traits of that era, both good (fascinating speculative ideas) and bad (weak characterisation). It takes a while for the main focus of the plot to become apparent. The story mostly takes place in two different time periods, following the book’s two main protagonists. The first plot thread is the more compelling of the two and is set during the Cultural Revolution as young science prodigy Ye Wenjie finds herself assigned to a mysterious government research project. The disorienting paranoia of the Cultural Revolution is well-portrayed; with Ye’s story beginning as her family falls apart due to her father’s persecution for daring to teach physics theories regarded as ideologically unsound. Ye’s stubborn endurance through the various disasters that befall her does make her a compelling character and although she makes some fairly extreme choices later in the book I think the way her character develops does make her behaviour plausible. Unfortunately, I didn’t find the book’s other protagonist to be anywhere near as compelling. Wang Miao is a modern-day research scientist and unlike Ye Wenjie he is living a largely unexceptional existence until the day he is called in to a secret government taskforce investigating what they believe is a high-level international conspiracy lead by a cabal of scientists. The taskforce is also investigating the suicides of a number of prominent researchers, who seems to have to have been driven to despair after experiencing things that seem to defy the laws of physics. I think this part of the story is a bit hit-and-miss. I think the highlights mostly happen when (after a tip from another scientist) Wang Miao starts playing a hugely complex online computer game called “The Three Body Problem” set on a planet mostly inhabited by Chinese historical figures whose civilisation goes through endless rises and falls due to unpredictable and sometimes cataclysmic shifts in climate due to the erratic behaviour of the planet’s Sun with the players having the task of explaining these climatic shifts. How this relates to the rest of the plot isn’t immediately apparent but makes more sense as the story goes and the game does feature some memorable imagery used to convey various scientific ideas. The idea of a civilisation of beings that can dehydrate themselves to go into extreme hibernation through nights that last for years isn’t entirely new in Science Fiction but it’s still a fascinating concept and there are other nice touches such as forming a computing device out of tens of thousands of perfectly-drilled soldiers (which seems a very Chinese concept, reminiscent of the choreography of the Beijing Olympics opening ceremony). Unfortunately, it’s the portions of the story that aren’t set in either the Cultural Revolution Era or inside the virtual world that seem least successful. I think the characterisation is one of the big problems here. Most of the characters are dull, and at times it feels like most of them seem incapable of experiencing any kind of genuine human emotion. I’m not really sure if this is an attempt at commentary on the disconnection from normal society of scientific geniuses, or just poor writing. For example, Wang Miao is married and his wife does appear in a few scenes but although he’s going through many traumatic experiences at no point does he ever seem to consider confiding in her and he barely seems to think of her. I don’t know whether this is meant to be a commentary on the state of his marriage or just poor writing on part of the author, but either way it doesn’t help him feel like a likeable or interesting character. Most of the other characters in this part of the story seem mainly to exist to provide exposition and have little character depth. The most interesting character is Da Shi, a veteran policeman assigned to the taskforce with a down-to-Earth approach that clashes with Wang Miao’s way of viewing the world, he’s a fun character but by being so lively he does make the rest of them seem even duller in comparison and the maverick detective who doesn’t work well with others but is good at his job is a bit of a cliché. The dialogue is also poor (maybe it’s lost something in translation); too many of the conversations don’t feel like something people would actually say. Character motivations are also an issue, while the two protagonists have properly-established motivations it’s sometimes hard to see why some of the other characters are doing things – for examples while I could believe some scientist being driven to suicide if their cherished theories were apparently disproved I think at least some of them would be more likely to take on the challenge of trying to find an explanation. The science in the book is often fascinating; there are some compelling ideas in the story and they’re mostly clearly explained, but there are some weaknesses. For most of the book it could be described as reasonably plausible Hard-SF but some events near the end do seem to get very far-fetched (and one scientific breakthrough seems too advanced compared to the other things we see). There’s also an issue that a key plot point relies on ignoring a basic astronomical fact, but since the story wouldn’t really work otherwise I can understand why the author did it. Overall, I would recommend this book despite its flaws and I think I will read the sequels when they are published. The characterisation may be very variable in quality and there may be a few significant plot holes but it does have some very good scenes, an unusual and memorable setting and some fascinating ideas.